Hit me up ASAP if you are interesting in sponsoring The Life of Bon this month. The rates can't be beat! Friday I lathered up that sunblock, put on my trusty swimsuit and made out for the splash pad with my husband and my 18 month old niece in tow. It was a scorching afternoon, with temperatures passing one hundred degrees and not a drop of moisture in sight. The house wouldn't cool down below eighty, doing anything outside sounded miserable, and our energy was all but zapped to pieces. So we headed for the splash pad. A little more than just hosing off in the backyard, but not quite a full on swimming pool, the splash pad seemed the perfect compromise. Is there anything in the world cuter than a baby's bum? 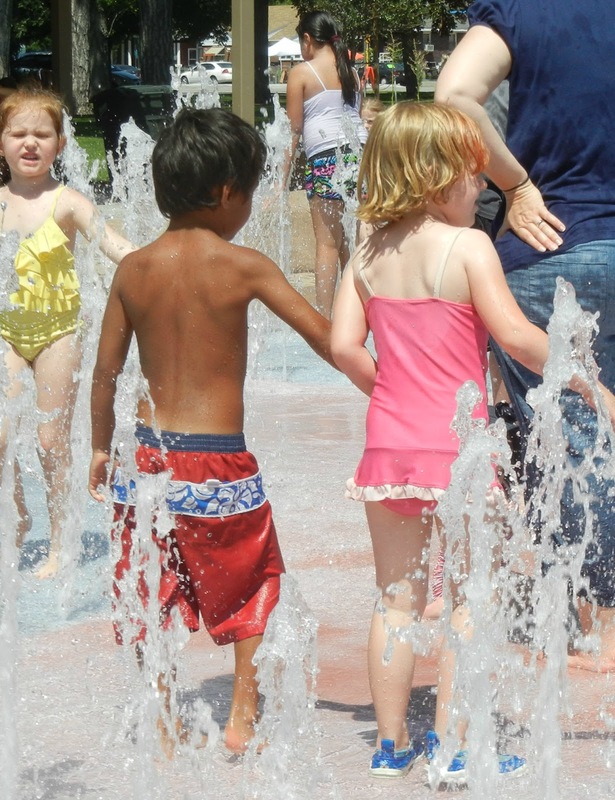 I just finished reading The Help and I've been following the Treyvon Martin case with interest so I suppose complicated and confusing ideas about race were swirling around somewhere in my head when I saw these two little guys running around the splash pad together. I don't know all the answers about the tough stuff in life. I don't know if the verdict on the Treyvon Martin case was correct or not. I don't know if it was all a big misunderstanding or if it was a hate crime against a minority. I know none of that. I do know that all of us adults sit all day long and talk until we're blue in the face. We argue our side, we get political, we listen to endless news stories about a case like this. We call it hate, we call it murder, we attack those on the opposing side. And in the meantime a black and a white kid are just holding hands, running around the water park. They don't notice the color of the skin. Why in the world would that even matter?One of my favorite scriptures in the Book of Mormon states that to be saved we must become, "as a child- submissive, meek, humble, patient, full of love." Isn't it weird that those who are the youngest are the best at showing love and understanding? I felt so much hope for our world when I saw these kids. To steal a quote from Raven, they know nothing of " hatred, intolerance, racism, bigotry, indoctrination, homophobia, racism and prejudice." These things are taught to them. Here's hoping we will be a little less quick to teach them these things. Here's hope that my children will be more understanding, open minded, and full of love and tolerance than anyone I've met before. I've been thinking about this topic lately as we'll. Thank you for the thoughtful post. 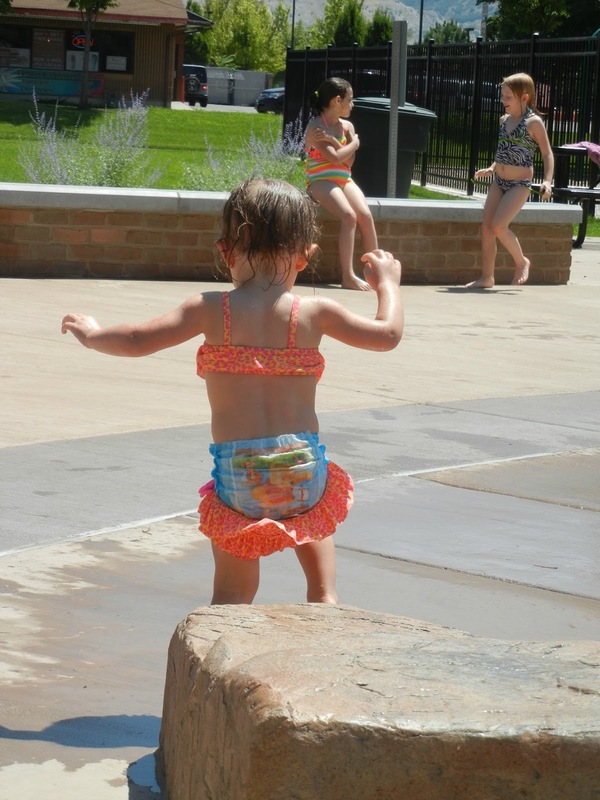 We were at the splash pad last weekend and I had a very similar thought process! This was beautiful! :) thanks for sharing your heart! I once volunteered at a daycare in a community that was a mix of caucasian, hispanic, and laotian children. One day, I heard some kids talking in a language I didn't quite pick up. Turns out, they had sort of created a hybrid of English, Spanish, and Laotian. It was amazing. And made me think similar thoughts to the ones you had while watching those two kids at the splash pad. That's just wonderful. I always think of something Kirsten Dunst's character says in Crazy/Beautiful--that if we all married someone of a different race or background, we would all look the same in a few generations. But it's important to remember that we are all the same inside...which children know when they are innocent and seem to forget as they grow. I imagine that heaven is like going back to being a child in your pure innocence, love, and joy. Bon, hands down the best blog post you have written ever. As an Australian I have just read up on the Treyvon Martin case and it sounds like everyone is being as racist as each other. I mean, why is race even coming into the equation?? I completely agree! My mom told me about my one little sister not too long ago that when she was in kindergarten there was "twin day" at school and kids were paired and would have to dress alike. Well there was one bi-racial girl in the class and everyone else white. The teacher paired my sister with the bi-racial girl and when she got home my sister was upset saying she couldn't be we twin. My mom thought to herself basically "here we go in going to need to explain race" and then my mom asked her why they couldn't be twins and my sister at 5 years old replied "because I have short hair and hers is long." As simple as that, no thought whatsoever to skin color. We all should be more like children I think. Bon I can't tell you how many times I've written about this. How many times in my life I've experienced crazy racially charged incidents. How I have to explain to my 7 year old that some people will automatically not like her because of the color of her skin. How following the Trayvon case how thankful I was that I do not have a son. (how sad is that....) I think it takes a lot of courage to talk about things like this, but you are so right. We are TAUGHT to hate. We don't come out of the womb seeing color as a bad thing. Of course children know that they look different than each other, but they don't care. So why do we? That sounds like a fun day at the splash park. We dsicussed "The Help" (movie version) very extensively in one of my classes a two years ago. The class dealt with race and its representation in the media. I wrote a long paper about the movie and looking at racial issues in how things were represented. It is very eye-opening to look at things from a different perspective. Also, have you seen the YouTube video about how kids respond to the multiracial Cheerio's commercial? It gives me hope that the future generation may be better than ours when it comes to dealing with racial differences. I put the link below in case you were interested.